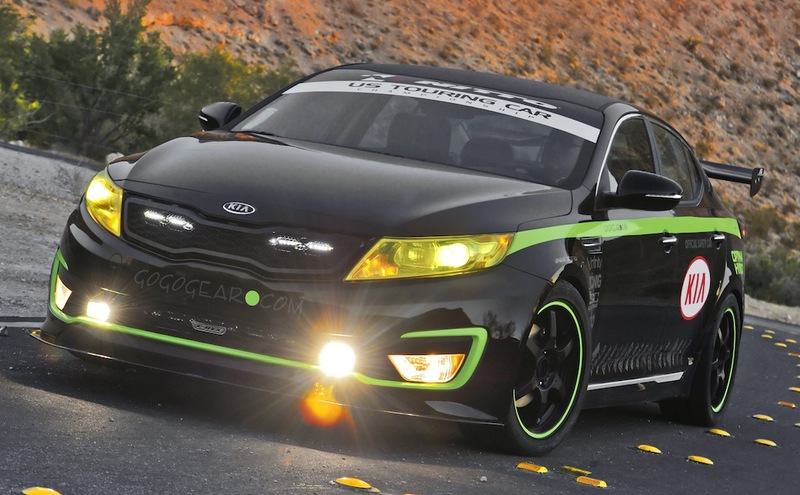 So, a Kia Optima with a Basketball paint job isn’t interesting enough for you? How about something really outlandish that’s based on the same car. Get this, a brand new Korean sedan is going to turn up to SEMA being as crazy as it can get, it will be acting as a pace car at the front of a USTCC race. Now, hot Korean cars aren’t that weird anymore but this one in particular is, especially as it’s a hybrid pace car, one that features all the glam SEMA dictates. This being SEMA, you’d expect build quality, originality, performance or downright stupidity in an attempt to grab some attention. This being Kia, you wouldn’t expect any of that and since they’ve decided to make a hybrid run along side race cars you’d think they had their beige pants on but you’d be wrong. Starting from the top, the drivetrain may be unaltered but everything else inside and out has been changed. 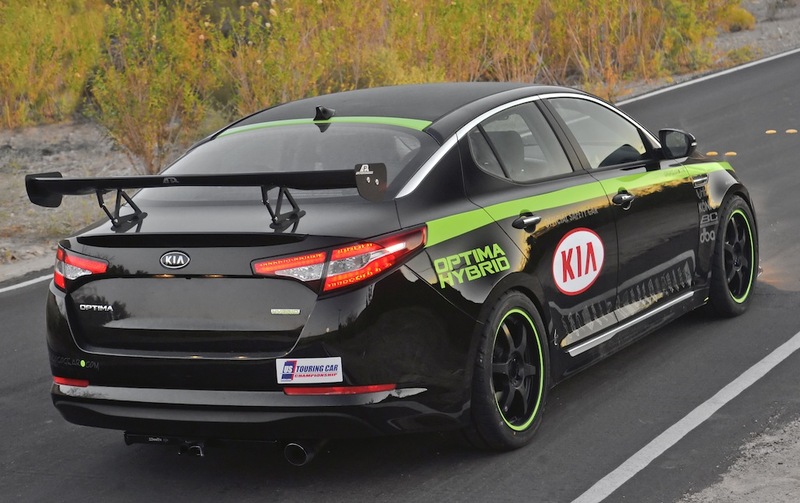 Not only does the new Kia Optima Hybrid pace car feature a racing livery it also has the usual tedious choices on hand. There’s a roll cage, a set of racing seats, a racing steering wheel, racing seat belts, racing alloy wheels with racing slicks too. 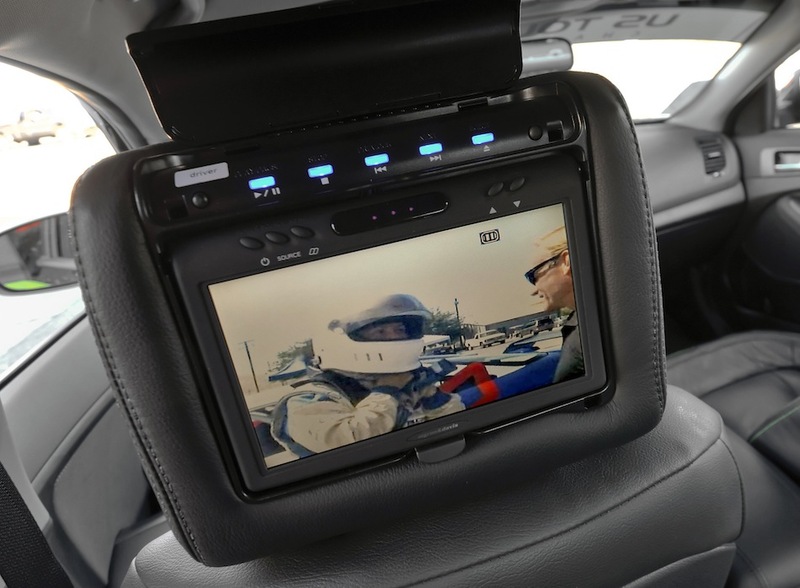 Sounds awfully practical, but in truth, the Koreans have provided 2.400 watt audio system, a host of in car entertainment features such as screens, LEDs and plenty of infotainment features mixed together.